DETROIT (Bloomberg) -- Mercedes-Benz, guarding its U.S. premium-auto sales lead, is letting some buyers skip more monthly payments than BMW and offering as much as $5,000 discounts to "VIP customers." Mercedes introduced a program for 2012 models sold through this month that included cash offers and special lease deals, according to an Oct. 2 memo to dealers. The automaker in an Oct. 5 e-mail to dealers also announced a promotion for the month that lets some current Mercedes owners forgo as many as five payments. Mercedes leads BMW by 5,221 sales in the United States through this year's first nine months. Weak demand in Europe is spreading to the region's biggest market Germany and deliveries in China slipped for the first time in eight months in September. 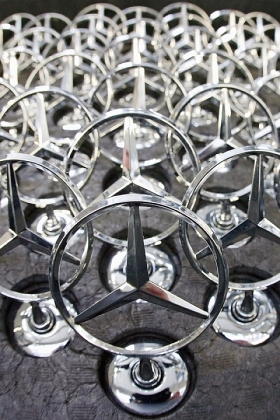 Those markets' struggles are putting more pressure on Mercedess and BMW in the U.S. market. "It isn't just about being No. 1," said Greg Goodwin, CEO of Vancouver, Washington-based Kuni Automotive, which operates 14 dealerships, including a BMW franchise, in Washington, California, Colorado and Oregon. "What BMW and Mercedes also are dealing with is global competition and the ebbs and flows of global demand." BMW last year outsold Mercedes and Toyota Motor Corp.'s Lexus, which had been hurt by vehicle shortages after natural disasters in Asia. Lexus had been the top-selling luxury-auto brand in the United States for 11 years. The five-payment program introduced by Mercedes is similar to a promotion that BMW is using this month. The automaker mailed owners of most of its 2010 models an offer to waive as many as three payments to buy a new or certified used vehicle, according to an Oct. 10 notice sent to dealers. The Mercedes deal lets owners of all models except the ML450 Hybrid SUV skip five payments to buy or lease any 2012 or 2013 vehicle through Mercedes-Benz Financial Services, according to the e-mail to dealers. "This is great news for luxury clientele nationally," Goodwin said. Mercedes has used lease pull-ahead promotions for almost a decade and has introduced such programs several times in 2012, said Donna Boland, a Mercedes spokeswoman. The Customer Advocacy Program from the Mercedes Oct. 2 memo sets maximum cash offers and suggests featured leases to dealers, who are being paid a $750 commission per sale. The deals "can be offered at the discretion of the dealership's general manager to VIP customers of the dealership, business associates of the dealership's employees and dealership employees' extended family members," the memo said. The cash offers include as much as $750 for C class and $2,250 for E-class cars, $3,000 for GLK SUVs, $3,275 for S-class cars and $5,000 for GL SUVs, according to the memo. The Customer Advocacy Program "has been around for a number of years" and is primarily used as Mercedes is winding down inventory of outgoing model-year vehicles, Boland said. This year's program is limited primarily to 2012 models, which are almost sold out, and the 2013 S class, which she said gets a new body style next year. "We limit the number of cars" in the program, Boland said. "It is not carte blanche." Most dealers don't give the maximum offer that Mercedes allows, and the commission that's part of the program is intended as compensation if a dealer does "give it all away," she said. Mercedes also is updating a program similar to an initiative that BMW ran in July that boosted sales to dealers' demo fleets. The Mercedes Courtesy Vehicle Program, running through Jan. 3, 2014, requires enrolled dealers to provide courtesy Mercedes vehicles at no charge to service customers who have at least two hours of warranty repair work. The dealers receive credit for a sale of a vehicle once it goes into their service loaner fleet, according to a memo from the manufacturer. Dealers are eligible for incentive allowances from $4,500 for C-class cars to $10,000 for S-class cars once a vehicle is in their service fleet for at least 12 months. The Courtesy Vehicle Program sets an annual fleet size for participating dealers, the memo said. The allocation is based on historical repair order data. Mercedes is in the process of determining courtesy fleet sizes for 2013, Boland said. Mercedes has had such a program for 10 or more years and announced details about next year's version as part of a national dealer meeting last week, she said. "A 'pain point' with customers is that they don't always receive a Mercedes-Benz as a loaner," Boland said. "That's what we're addressing here in a significant way. The loaners must be Mercedes-Benz and we in turn will help offset the costs." Once a vehicle goes into the courtesy program, it becomes part of dealers' pre-owned inventory. If a vehicle is taken out of the program and sold as used before 365 days, the dealer qualifies for an incentive allowance that's prorated for how much time it spent in the service fleet, according to the memo. BMW, which beat Mercedes last year by 2,715 deliveries in the United States, has shifted "tens of thousands" of cars that were originally targeted for Europe to the U.S. and Asia this year as sales weaken in the crisis-hit region, Ian Robertson, the sales chief for the world's largest luxury-car brand, told reporters on Oct. 17 in Munich. European auto deliveries are headed for their biggest annual plunge in 19 years after tumbling 11 percent in September, the Brussels-based European Automobile Manufacturers' Association ACEA said on Oct. 16. Japanese brands such as Toyota's Lexus also suffered a blow last month because of a territorial dispute between their home country and China that turned Chinese consumers away from buying the vehicles. "All of that points to more and more product coming to the U.S.," said Goodwin, who added that he expects BMW to stay competitive with luxury brands including Mercedes through the end of this year. "Our business is recovering well and there is still a lot of pent-up demand."